Phew...finally, I'm back! I know I haven't posted in a while, and it's because things have been pretty busy here. After 5 long years, I am (finally) getting my PhD, so the last few months have been: applying for jobs, interviewing, and now waiting for offers. In the middle of all this, I am writing my thesis and still working on papers and presentations. I know, I know...none of this is as important as blogging about food, but unfortunately I can't convince my thesis committee of that. Maybe they would be convinced, however, if they tried this quiche. 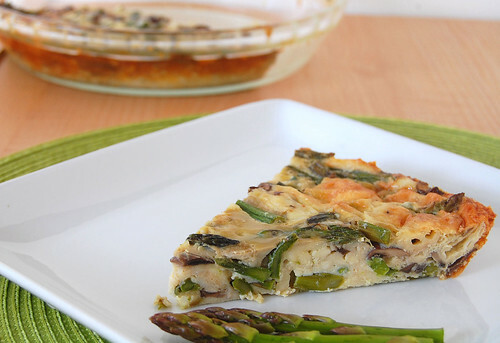 Full of asparagus and mushrooms, and a combination of three cheeses, it is amazingly tasty and very satisfying. It almost makes you forget about nerve-wrecking interviews, impending deadlines, and (what feels like) the thousands of hours of writing and editing that await you. Almost. This recipe is for a crustless quiche, and it so simple to make, it can easily be a weekday dinner. Perfect for days full of nerve-wrecking interviews, impending deadlines, and lots of writing. Yup, I think it’s pretty clear I will be making this dish often in the months to come. 1. Preheat oven to 425 degrees. Heat the oil in a skillet, add shallots, and cook until just translucent. 2. Add the asparagus and cook for 3-4 minutes. Add mushrooms and cook for an additional 3-4 minutes. Pour into pie pan. 3. In a separate bowl, whisk together eggs, milk, cheese, and flour. Pour over asparagus mixture. 4. Bake for 25 minutes. Cool for 10 minutes before serving. Yeah so I'm thinking that if you brought this to your thesis defense. They would totally understand. And pass you with flying colors. Looks delicious! This looks drop dead gorgeous. I'm making this as soon as I have some asparagus at my disposal. I really love recipes like this one. What a gorgeous presentation. I just feel like grabbing the quiche and biting them like a snack! The vegetarian version of the floss is veggie floss! I'M. SO. JEALOUS!!! I can't believe you're finishing up!! I'm gonna cry tears of joy and jealousy haha. I'm so happy for you!!! You totally distracted me from the beautiful plate of quiche you made with this news haha. Okay, I've calmed down now. Your photos look amazing!! The quiche looks absolutely perfect. GOOD LUCK WITH EVERYTHING!! I'm so proud of you! methinks crustless is the way to go--there's nothing that mucks with one's mood quite like a fickle dough. i remember how stressful it was during the end of my graduate studies (how could one forget?!? ), so i wish you the best of luck in your job hunt and thesis work! Amazing, isn't it? It almost looks like it HAS a crust! Super recipe! I wish you the best pulling everything together now that you're near the end of years of hard work. You must be so proud of yourself! So delicious and much lighter that the pastry version! Cooking, running, meanie-ing, and phd-ing...deserves at least two phds. I've never made quiche before, only bought frozen ones. This will be my first time. Hope I make it right! Have a lovely weekend! Congratulations on getting your PhD! What a great accomplishment. I'm so impressed you have time to bake at all. The quiche looks healthy and delicious. This sounds reallly goooood!!! I love that it doesn't have a crust, because I'm really not a fan of those doughy pastries. A great seasonal brunch dish! I'd love to add some feta or goat cheese in there, too! YUM!! Looks like a perfect take to work gourmet lunch too! I love the no crust thing. 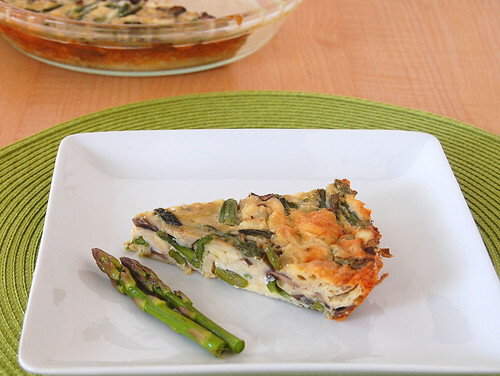 Crustless quiches are great and your version looks delicious! Congratulations on your PhD and good luck with the job interviews. Hey Ms. Meanie, this sounds so delicious, and, though I love buttery crust, this is better (health-wise)! I had seen the SK version of this before, but couldn't imagine liking it because it contains spinach. If only I were as creative as you are and had thought about replacing it with asparagus. Now it looks unbelievably yummy and I can't wait to try your version.